Verbena Editora, in Brasília, published Desafios aos direitos humanos no Brasil contemporâneo in 2011. 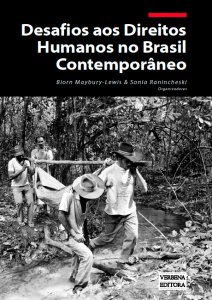 Sônia Ranincheski, now a professor of political science at the University of Rio Grande do Sul, and Biorn Maybury-Lewis, executive director of CIBS, are the co-editors. Please click on the title, above, and download directly a complimentary .pdf version of this book.